Damn Damn Damn. I am in a predicament. This ride was the best ferris wheel I think I have ever been on. Excellent views of the ocean, the boardwalk, the other piers and so on. But the line handling was soooo bad. There were about 4 people in the line and it took us around 20 minutes to get on. Yeah. So for that I give the ride a 7. But a fantastic ride otherwise. Allow me to swallow my pride and inform anyone reading this that I am deathly afraid of ferris wheels. I have a good feeling that it is because I have seen those ferris wheel accidents over and over again on Real TV, and other tabloid reality shows. So, needless to say, I was about a needle and a thread away from a stroke when I got onto this thing. "Why would you go on it if you hate them? ", you might ask. Ah, yes, the power of a girlfriend. I was clinging on for what I thought was my life. I was white knuckled, grasping onto the sides of the car, eyes closed, telling her not to move around because she was going to rock it and we were going to plumite to our demise. Im such a freakin wuss. Well, you should have seen me in the haunted house. But anyway, when I finally opened my eyes, the view at night was amazing. I could see all of the piers and Boardwalk lit up in all of their glory. Incredible. It was truely a romantic experience. Not only this, but it is just a classic boardwalk staple on a grand scale. When you think Moreys Piers, think the Giant Wheel. Well, you will probably walk away thinking "Watch the tramcar please." But when that crazy, and annoying, phrase gets out of your head about 3 weeks later, think of Moreys Piers and you will have an image of the Giant Wheel in your head. That is why I enjoyed it. You get a very nice view of the Ocean and all of the rides. Look to your right and see all of Wildwood. Look to your left and see the ocean and beach. Look down, and you see the ops arguing. Look up, and see seagulls. This ride is very unreliable when i was there. I was never a big fan of ferris wheels. This is a little bigger then the average ferris wheel. The carts are awesome looking and the ride runs like an average ferris wheel. But it just does not satisfy me like coasters, flumes, drop towers, etc. I would rather spend my time on a thrill ride. This is your classic large ferris wheel which is aways visible to the kids from the Garden State Parkway and also miles before you make your approach into Wildwood. The high rating comes with the rides grand height and its panoramic view of the boardwalk, shoreline and surrounding area. For the most spectacular view, ride this at sunset on a clear summer night. You will not be disappointed. its the GIANT wheel, not big wheel!!!! Get it right! Team GW 03: best ride crew in the world!!!!!!!!! 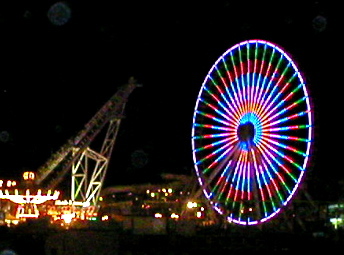 The ferris wheel is a Wildwood icon, a must ride for a visitor! IF YOUR R LOOKING FOR A GREAT VIEW OF THE WILDWOOD SHORE LINE THIS IS THE BEST WAY TO SEE IT..HIGH ATOP THE GIANT WHEEL.. 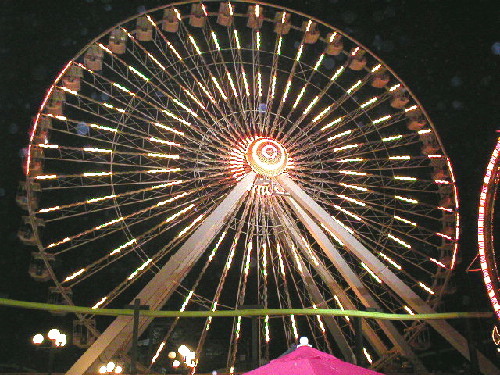 IT IS THE FIRST THING YOU NOTICE AS YOU ENTER THE SHORE..THE KIDS IN THE CAR SAY, LOOK THERE IS THE FERRIS WHEEL, WE ARE HERE..IT LOOKS SOOOO AWSOME AT NIGHT..I SHOULD KNOW I WORK UNDER IT EVERY NIGHT..IT IS SUCH A SPECTICAL TO SEE AND RIDE...GO AND RIDE IT..